ProHealthCare approached The SeedMill, enquiring about redesigning the website and logo identity for their business. 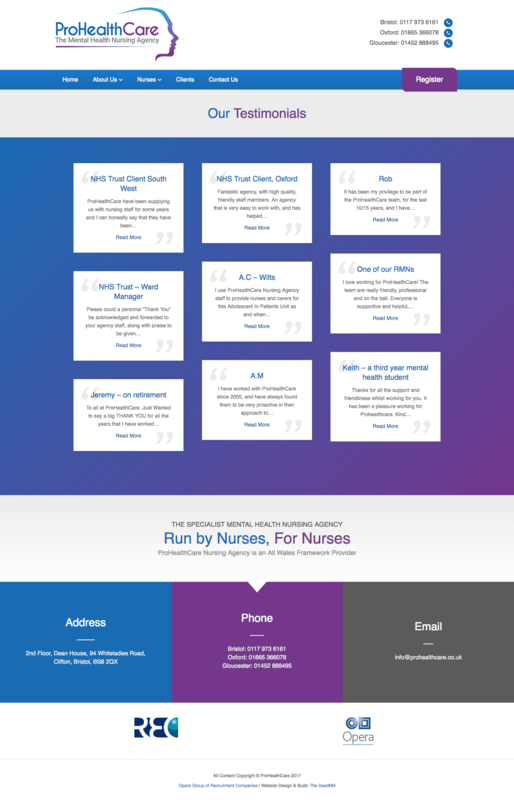 Previously ProHealthCare had a website driven from templates an old logo. Neither reflected their business any longer and they wanted to establish a stronger brand presence with a logo, website and messaging that promoted the business and its unique selling points more fluidly. 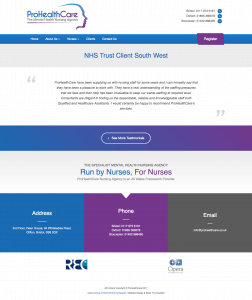 Additionally, ProHealthCare required consultancy on and development of WordPress as a content management system, realising that this offered a more flexible approach to their current systems. Weekly discussions were scheduled between us (The SeedMill) and ProHealthCare to identify a best direction and review the logo design and the website redesign / redevelopment. During the consultation process clear objectives were identified with both the logo and website, providing targets to work towards. 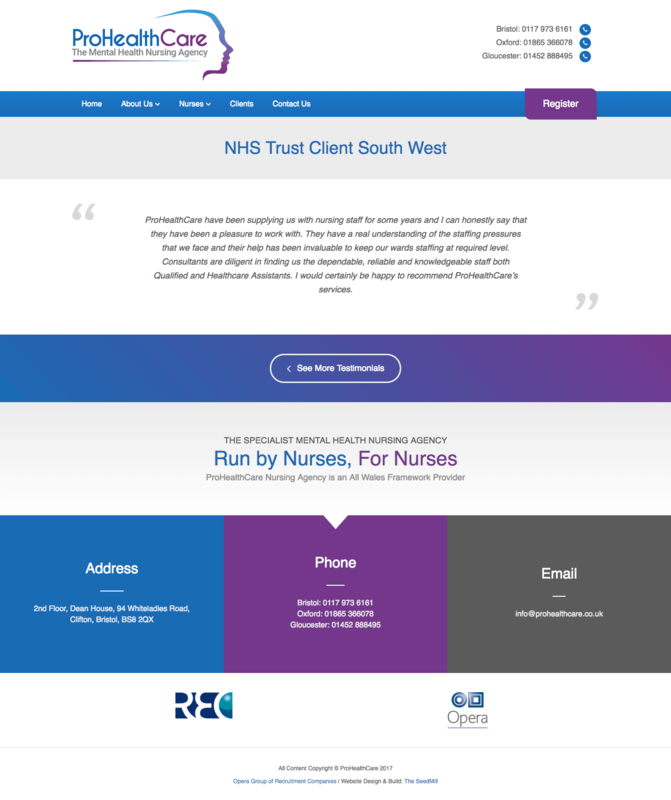 We then assisted ProHealthCare with the strategic direction for the website, underpinning all creative decisions with justifications towards this larger strategy. In turn, because of the high level perspective gained from this, we were able to create designs and layouts for both the ProHealthCare logo and website that were objective driven. The consultation process also allowed for multiple feedback and revision rounds. This gave ProHealthCare ample opportunity to steer the project. Partly due to the particular process that we adopt and the fact that ProHealthCare and The SeedMill were a good fit for this project in the first place; the feedback sessions became liberating as opposed to typically stilted and fractious. Every consultation moved the project forward quickly and reasonably, stripping away unnecessary revisions and allowing us to provide a high-quality solution without distractions. 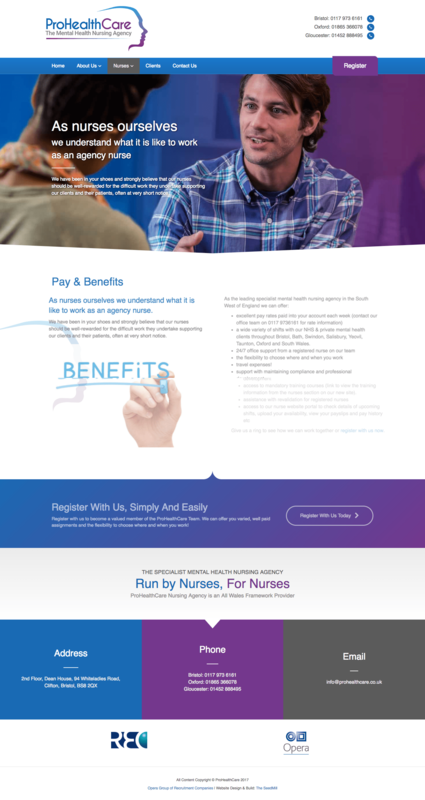 The resulting website and logo have been critically well received, both in-house within ProHealthCare and by their clients. The logo identity that The SeedMill created is fresh and emphasises ProHealthCare’s specialism in the mental health market and allows scope to develop a rich brand presence. It is also flexible and adaptable enough to be able to display across multiple mediums. 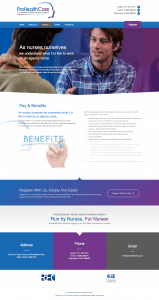 The website visual approach evolves on from the logo identity, using the rich blues and purples repeatedly throughout the designs on the various pages. This not only gives a fresh look and feel to the website but also provides scope to carry high contrast areas where needed for emphasis. Emphasis and high contrast are given to the various key messages and call-to-action areas on the website, concentrating on really driving the point home about who ProHealthCare are and how they can help prospective nurses. Essentially, the website was geared around promoting contact with the business by registering with the website or simply picking up the phone to call them.